Three questions with Suzanna Antal-Proietti, owner of WellnessWisdom Inspires. I started WellnessWisdom Inspires in 2007 primarily as a way to empower, enlighten and guide individuals and groups to well-being and creative healing through a variety of holistic methodologies. I believe that wellness and a balanced life are possible for all individuals through self-discovery, mindfulness and harmony. WellnessWisdom's main philosophy is to inspire creative potential and transformation! 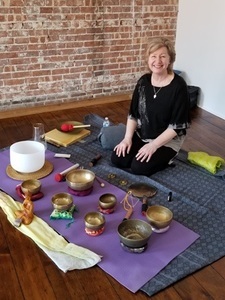 My best selling services are integrated and personalized sessions that balance mind, body and soul, such as sound therapy, mindfulness meditation and Reiki energy healing. I also offer guidance through life coaching and host sound meditation group classes and events throughout the year. The most popular products that I sell are aromatherapy essential oils and pain relief creams. I wish I could 'wave a magic wand' and have people trust their own intuition, listen to their inner voice and allow their creativity to manifest their dreams. My biggest wish is that our world would wake up to our collective potential and that more people would seek out those businesses, groups and individuals who are promoting and helping others to better themselves. And, I also really, really wish I had another 100 years to do my creative projects, or at the very least, a support staff to help me with my work. Visit WellnessWisdom Inspires online here.